This world is simply ablaze with bad ideas. There are still places where people are put to death for imaginary crimes – like blasphemy – and where the totality of a child’s education consists of his learning to recite from an ancient book of religious fiction. There are countries where women are denied almost every human liberty, except the liberty to breed. And yet, these same societies are quickly acquiring terrifying arsenals of advanced weaponry. If we cannot inspire the developing world, and the Muslim world in particular, to pursue ends that are compatible with a global civilization, then a dark future awaits all of us. When I was a teenager I read Friedrich Nietzsche’s Antichrist, and I thought of him as a folk hero. Picture the Christian religion as a piñata, then Nietzsche’s Antichrist is a six foot five inch, 330 pound football linebacker with an aluminum baseball bat, going for the piñata. Can you hear the crushing blows of the bat against the cardboard side of the piñata? If Nietzsche’s book was a baseball bat, then Sam Harris, with The End of Faith, hits the piñata with the cannon of a battleship. And he does not just go after religion in general, he hits every one of them with devastating blows, and Islam the worst of all. This is not easy reading. I have owned this book for at least a year, and it’s accompanied me on many a trip. Five to ten pages was the most I could read in any sitting before I had to put it away in throw in a light novel for distraction. Harris is a first rate scholar, a graduate in philosophy from Stanford University. He has studied both Eastern and Western religious traditions, along with a variety of spiritual disciplines, for twenty years. The soft cover book has 348 pages, 221 are copy, 8 are Epilogue, 8 are Afterword, 62 are Notes, 28 are Bibliography, and 14 are Index. I am telling you all this because when I picked up this book, I felt like I was working on reading assignments for an upper division philosophy class with all the trimmings. I realized how little I knew about organized religion, that I was a most undeserving atheist in all my ignorance. I resolved that I should buy a Bible and a Koran so I could refer to them and I’d know what I was talking about when I made an argument against organized religion. I realized that I could start over again, from the time at Glendale Community College in the spring of 1978, when I took Philosophy 101 from J.C. Volgo and Ethics from Bob Hubbard, my first academic tiptoeing into philosophy. There is a lifetime to study just on this subject. On the other hand, I could just keep The End of Faith on hand as a reference work. …Sanctimonious eruptions announcing the death of the pope (a man who actively opposed condom use in sub-Saharan Africa and shielded frocked child molesters from secular justice)…. …Muslims in several countries are rioting over a report that U.S. interrogators desecrated a copy of the Koran. Seventeen people are dead and hundreds injured. The response of the U.S. government has been to offer up some lunacy of its own. No less a spokeswoman than the Secretary of State [Rice – this was in 2005] has assured the righteous hordes that “the United States government will not tolerate any disrespect for the holy Koran.” What form our government’s intolerance will take remains unspecified. I await a knock on the door. I have to curb my enthusiasm here, lest I quote the whole book. I cannot think of a stronger indictment of religion in recent literature than this work. 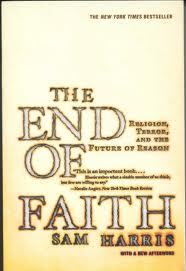 It fiercely exposes the absurdities of organized religion. It makes you think about what’s going on in the Middle East, and has been going on for millennia. It gets you to think about Bush and his cronies, and the exploitation of an escalating level of ignorance in our general population when it comes to reason, objectivity and general scientific education. You come away scared for our safety when you realize that the likes of Palin are making progress in 20 or more states to try to stop teaching children the biological fact of evolution. For me, reading Harris was an assertion of my intellectual, spiritual and ethical fabric. I wonder what it would be like to a religious person, Christian, Jew, Buddhist or Muslim alike? A nuclear assault on the foundation of their belief structure? We will hear more of Sam Harris in the years to come. Reblogged this on Norbert Haupt.